OLD TOWN, ME (July 2, 2015) – You’ve probably heard the adage that 90 percent of the fish live in 10 percent of the water. Spend enough time studying your fishing electronics and you’ll know there’s some truth to the old saying. Over a half century ago, fishing pioneer Buck Perry taught us that fish relate to structure – depth transitions along the underwater landscape – and within this structure, cover like rock, wood, vegetation and manmade habitat. In a nutshell, the proverbial fish-holding 10%. Still, sometimes that 10 percent can be hard to reach in a typical 18- to 20-foot bass boat or multi-species rig. Think river backwaters, bays, coves, creek channels and small rivers. But not for kayak anglers, whose easily-transportable vessels glide through skinny water, are easy to portage over land where necessary, and offer superior maneuverability. 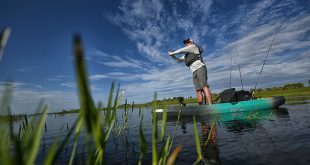 Fact is, kayak design has evolved to the point where each year more anglers are turning to the small watercraft as a viable alternative to traditional boat designs. It’s not that kayak anglers can’t and don’t fish from larger boats – it’s just that they prefer the advantages of a kayak. Again, kayaks are easy to transport, launch and load on hard-to-reach waters virtually untouched by anglers in larger boats. Like dumping right off a bumpy, dirt road into a bass-filled lake without a boat launch. Or near bridges where giant grouper wait like trolls … and tarpon shimmer in the sun. Or backwater or tidal areas where ravenous redfish fin through schools of bait, pouncing on anything thrown their direction. And new kayak designs are stable in still or moving waters. I know this for a fact, having fished trout and salmon out of a kayak near the breakers of Lake Michigan. Its stability in rough water was impressive. No water is impenetrable with a kayak. Outdoor writer Jim Edlund remembers fishing Lake Fork with a bass pro a few years ago when we spied two boats off in the shallowest, most timber-laden section of a cove. They could see bass far back busting bait – just past where they could easily maneuver. 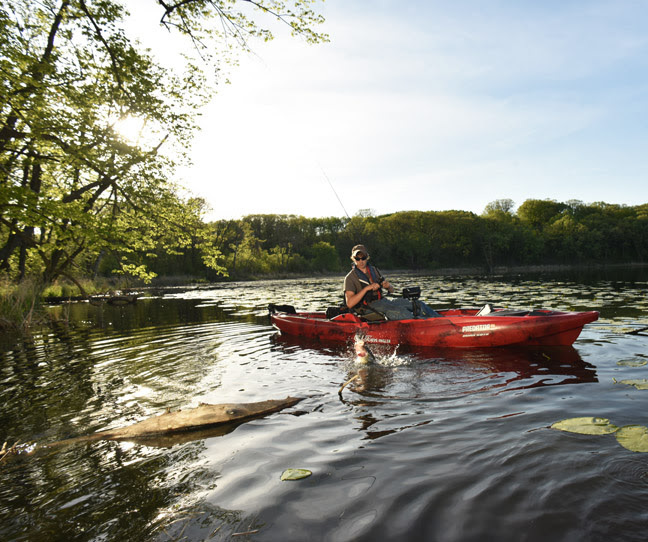 Not only do kayaks put anglers right where the fish are, kayak anglers are taking full benefit of all the high-tech features of boats many, many times their cost – like Humminbird electronics with a full complement of technologies including 2D sonar, Down Imaging, Side Imaging and high-definition LakeMaster mapping. Along these lines, there’s a lot of buzz on the water about Humminbird’s new Helix fishfinder family. Consider that the Helix 5 SI GPS brings anglers all these technologies for under $500. And with the Helix 5 Sonar GPS an angler can get sonar and GPS with a wide, high-definition display for under $300. Recently introduced Helix 7 is another great option for anglers who want a larger screen. Both the Helix 5 and Helix 7 offer functionality that would have cost thousands just a few years ago. Beyond high-tech electronics, it’s easy to accessorize kayaks for exactly the way you fish. Most fishing kayaks offer storage for tackle boxes, rods, rain gear … even a spot for a live well, mounting plates for Cannon rod holders, GoPro cameras, fishing electronics, various RAM-style mounts, etc. Models like Old Town’s Predator Series are even engineered to accommodate stand-up fishing with an included assist strap or optional steady-stand bar. That means pitching, flipping – even fly-fishing– is possible from the right vantage. The kayak that caught the attention of the fishing media at ICAST 2014 (where it won “Best Boat” and overall “Best of Show”) – is the Old Town Predator XL Minn Kota tri-hull fishing kayak, which at 13 feet long and three feet wide, has a whopping 600 pounds of carrying capacity. Not only that, it’s designed for anglers to fish completely hands-free at will. No, it’s not foot pedal controlled. It’s motorized. And the power comes sourced from a company we’ve come to rely on over the years to salad-slice our bass boats through some pretty serious slop: Minn Kota. It’s ingenious, really. The Predator XL Minn Kota is designed to accept any of three XL consoles that fit into the hull of the kayak cockpit. 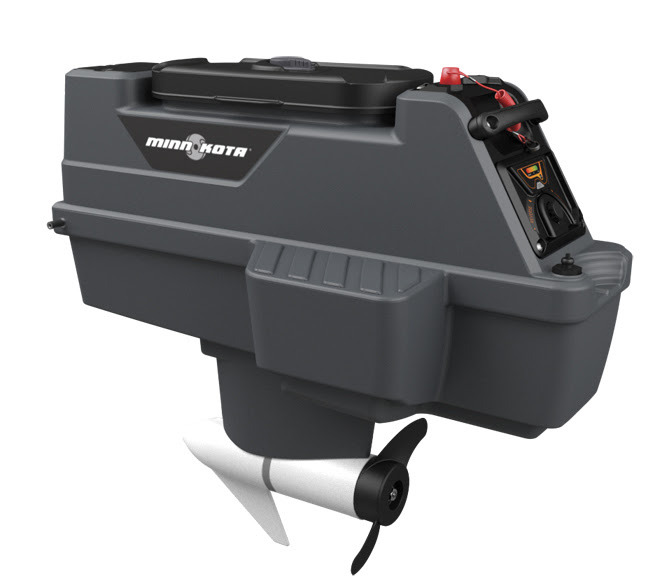 The most impressive of the three is the Minn Kota motor console, which provides 45 pounds of variable thrust, forward and reverse, and saltwater-grade power. Boat control is accomplished via a foot-controlled rudder system, which means you can move from spot to spot with ease, troll, and maintain precise boat control … without ever lifting a paddle. The motor was also designed with minimal operation noise, which means fewer spooked fish. The motor console also includes Minn Kota’s Digital Maximizer technology for long battery life, dual kill-switches for safety, LED charge indicator, USB charge ports (helpful for charging smartphones), a sonar mounting plate, battery/cable storage, and integrated storage that can easily converted into bait/livewell, cooler, or tackle/dry storage, depending on your needs. With regards to power, the Predator XL Minn Kota features pre-run wiring with trolling motor plug-in outlets fore and aft. There is ample space right behind the three-position Element Seating System to carry your favorite brand 24- or 27 group size 12 volt deep cycle battery for long days and nights on the water. Minn Kota’s Battery Power Center is the perfect solution to house the battery from the elements and power your trolling motor battery and fishfinder via easy access external battery terminals. It also features a built-in battery meter that displays charge, two 12-volt accessory plugs (great for charging phones, GoPro cameras, or running your aerator, LED lighting, etc. ), and two manual reset circuit breakers (10 amp for accessory plugs and 60 amp for trolling motor). At $65, it’s a smart investment for angler. 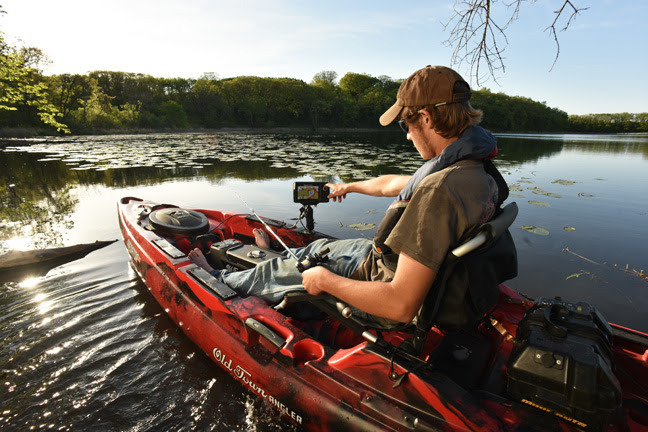 The Minn Kota Power Center comes standard with the Minn Kota motor console for the Predator XL. 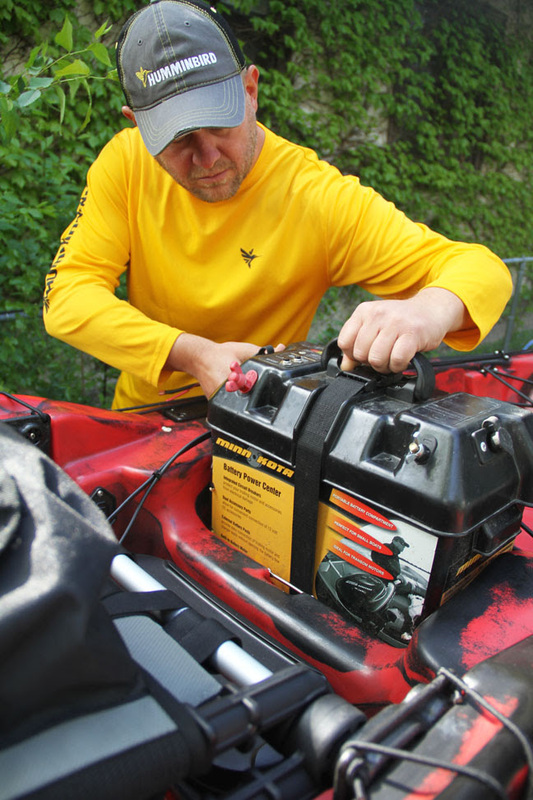 Speaking of power, some anglers are going the route of less weight, more consistent power and faster recharge times via lithium deep cycle batteries, like those available from Solarsportsman.com. While their benefits are many, lithium technology is not inexpensive. For those who prefer paddles to motors, the Predator XL is available with two other problem-solving consoles. A motor-less large-capacity utility console makes a great baitwell/livewell – especially with the addition of a Frabill Aqua-Life Spray Bar aeration system – but will also function as a cooler, or storage for fishing electronics battery and tackle boxes. Or anglers can go minimal with the flush-to-floor Exo-Ridge console to maximize room for stand-up fishing. 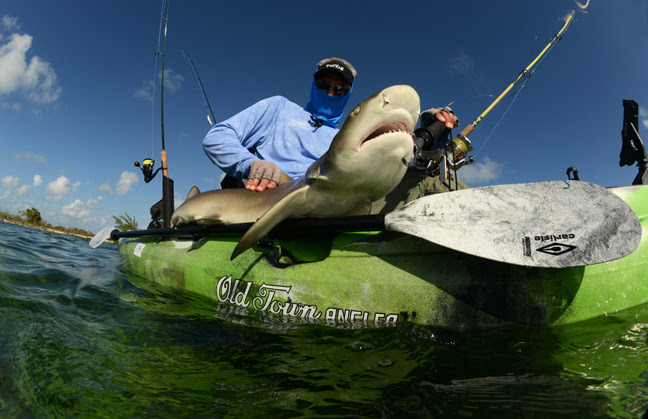 Fishing industry PR guy Noel Vick is a passionate, arguably neurotic kayak angler. With an office located an hour north of Minneapolis, Minnesota, he is squarely situated amongst primo small to midsize lakes and manageable moving water. Kayak nested in his FLOE Cargo Max trailer, Vick not only puddle jumps locally, but also commutes hither and yon, considering his kayak as essential to travel as a toothbrush and clean boxers. Ohio-based fishing writer and Old Town pro staffer Mike Mainhart is another diehard kayak angler who’s challenged the kayak fishing context, taking his Predator XL into some extreme situations. This past year, Mainhart watched the December weather until it was possible to troll the break walls of Lake Erie for giant nighttime walleyes. Two days before Christmas everything lined up and he slipped the 13-footer into the world’s 11th largest lake. “The Old Town Predator XL is made for big-water conditions, but I also have all my safety equipment, including wearing a Mustang cold-water survival suit,” says Mainhart. Mainhart’s plan was to “practically scrape the paint off a Smithwick Perfect Ten” by flat-line trolling right against the breakwall. 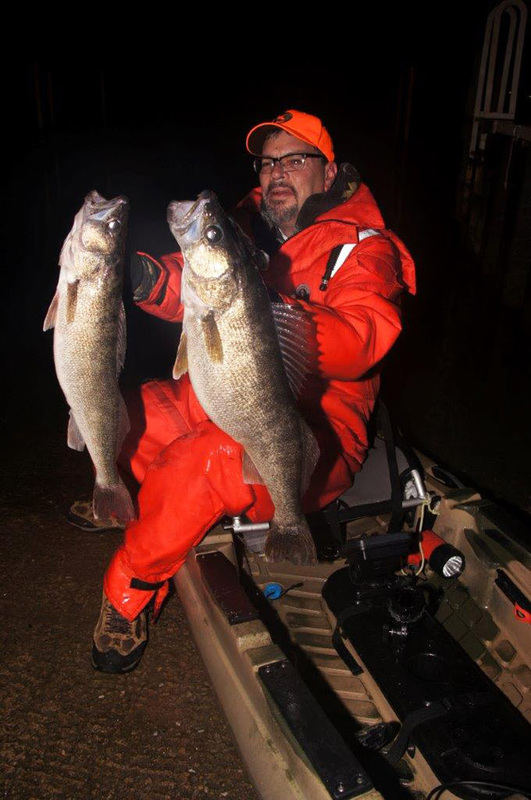 “The water depth within arms’ reach of the wall was holding around 13 feet with humps and peaks up to eight feet – the perfect depth for late-season walleye after dark. The soft amber-glow view on my Humminbird’s Down and Side Imaging was showing some amazing imagery of the rocky bottom near the wall. You could actually see large fish (marks) tucked in-between the peaks and valleys created by the rock structure,” adds Mainhart. He and fellow fishing writer Paul Liikala fished a few hours that evening from their separate boats, keeping in sight of each other’s lights for safety. And Mainhart accomplished what he set out to do. One more bucket list item crossed off, thanks to the Old Town Predator kayak. Not only are freshwater anglers fishing everything from farm ponds to the Great Lakes, bluewater anglers are taking to the sport with zeal. Case in point, the guys from Extreme Kayak Fishing Hawaii, who are using Old Town sister company Ocean Kayak boats to target giant yellow fin tuna, sailfish, ono and mahi mahi miles offshore the Big Island! Meanwhile, back inshore, the Minnesotan Vick swears the stork dropped him off in the wrong zip code, even time zone – guy should’ve been born alongside at least brackish water. So driven by his saltwater DNA, he pounces on every opportunity to kayak and cast inshore waters. So, whether it’s fresh- or saltwater – kayak fishing is here to stay. Anglers across the globe are choosing to fish out of smaller craft because the advantages are many, not to even touch on the cost savings. And that fish-holding 10 percent of the water? Old Town and Ocean Kayaks will get you there. Imagine paddling a few miles to reach some secret spot, catching fish until your arms and shoulders are sore … and then realizing you can motor back to shore, nursing a cold bottle of water, relaxed and feeling victorious. That’s the true power of the Old Town Pro Angler XL Minn Kota, the ultimate fishing machine – easily and infinitely customizable for exactly how and where you fish. Call it the fishing kayak of the future … but it’s here today.